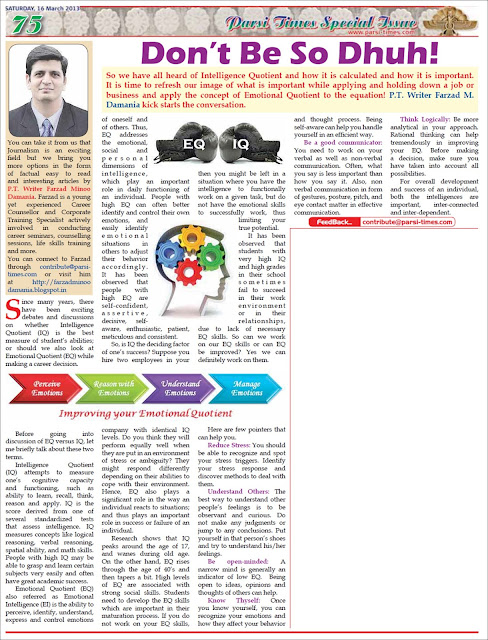 Check out my article in Parsi Times Newspaper dated 16th March 2013, discussing the importance of Emotional Quotient (EQ) in Career and Professional Development titled “Don’t Be So Dhuh!”. So we have all heard of Intelligence Quotient and how it is calculated and how it is important. It is time to refresh our image of what is important while applying and holding down a job or business and apply the concept of Emotional Quotient to the equation. PT. Writer Farzad M. Damania kick starts the conversation. Since many years, there have been exciting debates and discussions on whether Intelligence Quotient (IQ) is the best measure of student’s abilities; or should we also look at Emotional Quotient (EQ) while making a career decision. Before going into discussion of EQ versus IQ, let me briefly talk about these two terms. Intelligence Quotient (IQ) attempts to measure one’s cognitive capacity and functioning, such as ability to learn, recall, think, reason and apply. IQ is the score derived from one of several standardized tests that assess intelligence. IQ measures concepts like logical reasoning, verbal reasoning, spatial ability, and math skills. People with high IQ may be able to grasp and learn certain subjects very easily and often have great academic success. Emotional Quotient (EQ) also referred as Emotional Intelligence (EI) is the ability to perceive, identify, understand, express and control emotions of oneself and of others. Thus, EQ addresses the emotional, social and personal dimensions of intelligence, which are play an important role in daily functioning of an individual. People with high EQ can often better identify and control their own emotions, and easily identify emotional situations in others to adjust their behavior accordingly. It has been observed that people with high EQ are self-confident, assertive, decisive, self-aware, enthusiastic, patient, meticulous and consistent. So, is IQ the deciding factor of one’s success? Suppose you hire two employees in your company with identical IQ levels. Do you think they will perform equally well when they are put in an environment of stress or ambiguity? They might respond differently depending on their abilities to cope with their environment. Hence, EQ also plays a significant role in the way an individual reacts to situations; and thus plays an important role in success or failure of an individual. Research shows that IQ peaks around the age of 17, and wanes during old age. On the other hand, EQ rises through the age of 40’s and then tapers a bit. High levels of EQ are associated with strong social skills. Students need to develop the EQ skills which are important in their maturation process. If you do not work on your EQ skills, then you might be left in a situation where you have the intelligence to functionally work on a given task, but do not have the emotional skills to successfully work, thus limiting your true potential. It has been observed that students with very high IQ and high grades in their school sometimes fail to succeed in their work environment or in their relationships, due to lack of necessary EQ skills. So can we work on our EQ skills or can EQ be improved? Yes we can definitely work on them. Here are few pointers that can help you. Reduce Stress: You should be able to recognize and spot your stress triggers. Identify your stress response and discover methods to deal with them. Understand Others: The best way to understand other people’s feelings is to be observant and curious. Do not make any judgments or jump to any conclusions. Put yourself in that person’s shoes and try to understand the person’s feelings. Be open-minded: A narrow mind is generally an indicator of low EQ. Being open to ideas, opinions and thoughts of others can help. Know Thyself: Once you know yourself, you can recognize your emotions and how they affect your behavior and thought process. Being self-aware can help you handle yourself in an efficient way. Be a good communicator: You need to work on your verbal as well as non-verbal communication. Often, what you say is less important than how you say it. Also, non verbal communication in form of gestures, posture, pitch, and eye contact matter in effective communication. Think Logically: Be more analytical in your approach. Rational thinking can help tremendously in improving your EQ. Before making a decision, make sure you have taken into account all possibilities. For overall development and success of an individual, both the intelligences are important, inter-connected and inter-dependent. Check out my article on Parsi Times Newspaper dated 9th March 2013, on “Exam Stress - Just Beat It!!!”. Article Title: Exam Stress – Just Beat It!!! Board Exams have already started, anxiety and stress are the buzz words among students and parents. Students who experience exam stress may show the following symptoms: inability to sleep, irritable behaviour, loss of appetite, appearing depressed, feeling sick, unusual bad temper, restlessness, headache and stomach ache. Focus on Conceptual Study: It is very important to focus on conceptual study rather than rote learning. 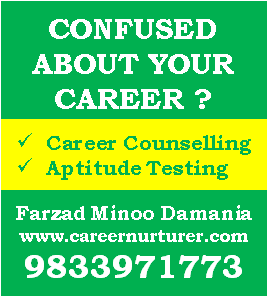 This helps in avoiding examination stress and also helps in the long run for better professional success. Plan your study: Create a timetable and prioritise your study process. Chalk out a plan and divide time allotted for each subject judiciously. Put more emphasis on subjects where you are weak. Find a dedicated study place: Get a study place which is relatively free from distraction. Avoid sitting near the television, computer, bed, or refrigerator. There is no harm in taking short breaks of 5 to 10 minutes after every hour of continuous study to optimize your concentration level. Practise and solve previous year’s exam papers: It is a good exercise to solve good number of past question papers, as it makes you aware of the exam pattern, marking scheme, and helps you develop a good strategy to face the exam paper. This will also help in developing self-confidence. Maintain a balanced diet: A balanced diet is very important for your health. Avoid eating food that is high in fat, sugar and caffeine. Avoid junk food during exams, it can spoil your health and all your efforts can go to waste. Avoid oily foods as it can make you feel lethargic. Do not skip your breakfast and dinner schedule. Reach exam centre early: It would be wise to reach exam centre at least thirty minutes before exam time. This will help in reducing anxiety. If your exam centre is outside your school, you could visit your exam centre a day in advance so that you can plan your travel time accordingly. Study Smartly: Make summary notes, keywords, tables, charts and diagrams; which help in improving your memorizing process. Re-learn difficult sections of your syllabus, and explain them to family or friends, which help in boosting your self-confidence. Ask for help whenever needed: If you are feeling stressed or nervous, do not hesitate to ask for help. Talk to someone you trust such as parent, teacher, school counsellor, or friend; as they will be able to help you put things in perspective. Avoid Negative Thinking: Negative thinking is one of the prime reasons for students undergoing stressful conditions. It is seen that your confidence is more important than your competence. Don’t think that your preparation is bad or not up to the mark. Go ahead and give your best shot. Develop a Positive mindset: Maintain a positive “I can do it” attitude. Your stress and anxiety will be transformed into positive energy which will help you improve your performance at the exam hall. Keep telling yourself “I will do well”. Visualization is another method of keeping our mind calm and relaxed. Try relaxation techniques: Deep breathing, simple exercises, dance, and music are some of the tools that can help you relax. But remember not to overdo it. These techniques are supposed to refresh you, and not tire you or wander your concentration process. Get adequate sleep and rest: Do not over burden yourself. Your body needs adequate rest before your exam day. You need to take at least 7 to 8 hours of sleep to recharge yourself. Do not discuss paper after exam is over: A very common habit of students is to discuss the paper after the examination is over. This can lead to unnecessary stress, anxiety and depression if your answers do not match. It can lead to negative thinking, and can affect your morale for the remaining examinations. Avoid comparing your abilities with your friends: Do not compare your level of revision with your friends. Each one of us approaches revision in different ways, so just make sure you have chosen the method that works best for you. Work hard and give your best: Hard work promotes self-belief and liberates you from stressful and negative thinking. Best wishes to all students appearing for their board exam. 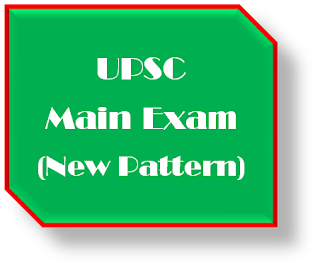 UPSC has made significant changes in the pattern and syllabus of the Main Exams of Civil Services Examination and these changes will be applicable from Main Exams 2013. Note: The prelim examination for Civil Services by UPSC has remained unaltered. However, UPSC has decided to conduct the same prelim exam for students who want to join the Indian Forest Services. Thus there will be a common prelim exam paper for both Civil services and Indian Forest Services. 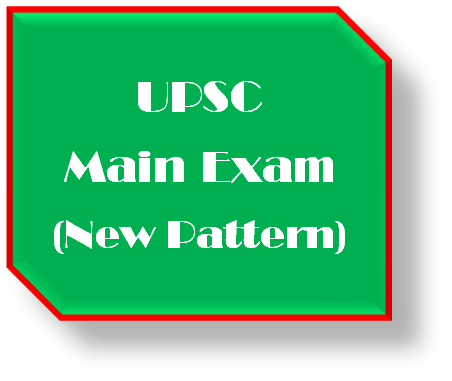 Here is the new pattern for UPSC Main Exams. There will be a total of Seven Papers in Main Exams. Note: Candidates may choose any optional subject from among the list of subjects given in Group 1. However, a candidate can opt for the literature of a language, indicated in Group 2 below, as an optional subject, only if the candidate has graduated in the literature of that particular language as the main subject. Agriculture, Animal Husbandry and Veterinary Science, Anthropology, Botany, Chemistry, Civil Engineering, Commerce and Accountancy, Economics, Electrical Engineering, Geography, Geology, History, Law, Management, Mathematics, Mechanical Engineering, Medical Science, Philosophy, Physics, Political Science and International Relations, Psychology, Public Administration, Sociology, Statistics, Zoology. All the best to all the UPSC Exam Aspirants!!! Youth Incorporated, Education Times and Rediff.com has announced the list of top universities across the globe for year 2013.